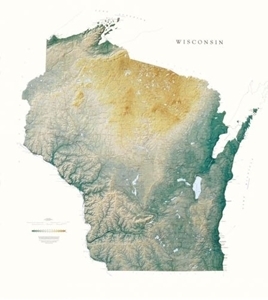 Highway Wall Map of Wisconsin & the Upper Peninsula of Michigan. Three sizes available. 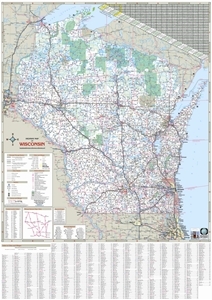 Wisconsin Highway Map 17" x 22"
Showing the Interstate System, State & Highways. 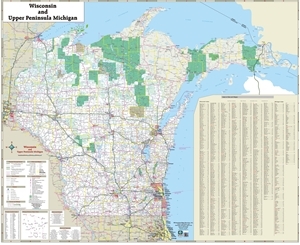 Includes an index showing all the cities & villages throughout the State. 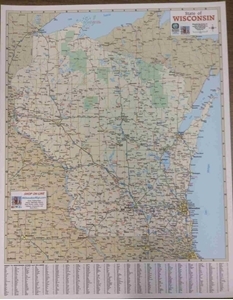 Opens to size: 17" x 22"
Showing the Interstate System, State & County Highways. Show & index all the cities & villages throughout the State. Also shown are the Universities, Colleges, Airports & Hospitals.